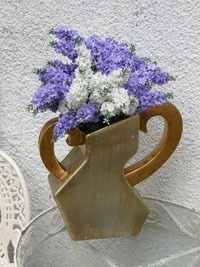 In this simple photograph of a hand-made vase of white and purple lilacs outside of a shop,"Lydia's," in the Lake District of England, the heritage of the biblical Lydia's hospitality is echoed. In the story from Acts for today's readings, the disciples are introduced to Lydia of Thyatira, a maker of purple cloth. A convert to Christ, she invited Paul and Timothy to lodge with her as they rested from their journey. Lydia's Vase, from Art in the Christian Tradition, a project of the Vanderbilt Divinity Library, Nashville, TN. http://diglib.library.vanderbilt.edu/act-imagelink.pl?RC=54210 [retrieved April 23, 2019]. Original source: Muddy LaBoue, Flickr Creative Commons.